Every year, the average American receives 675 pieces of unsolicited mail. Add it all up and it comes in at a hefty 4,000,000 tons of mostly unwanted mailbox filler. Wish there was something you could do to limit the amount that shows up in your mail box each week? There is. To cut down on catalogs, visit catalogchoice.org and check only the catalogs you want to receive. To receive less commercial advertising mail, visit dmachoice.org. This is the Direct Marketing Association’s Mail Preference Service, which allows you to opt-out of those pesky national mailing lists. 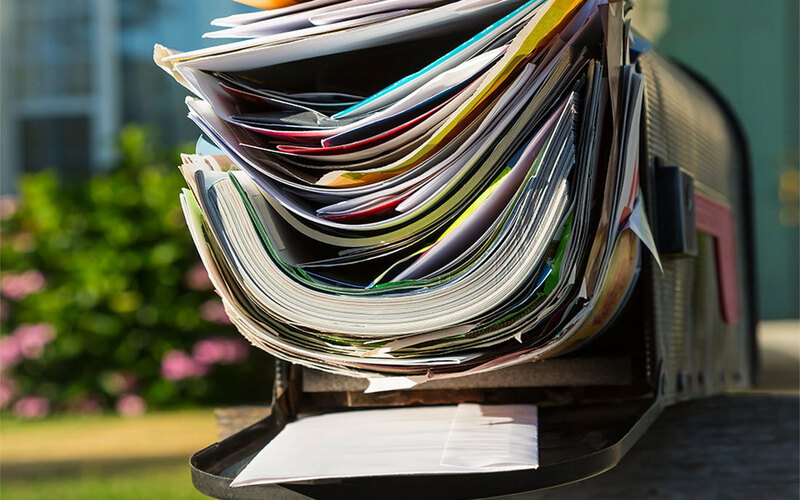 Please note that since many mailings are already in print or production, it can take up to 90 days for the junk mail to stop. To get your name off the list for credit card solicitations, call 1-888-567-8688 (that’s 888-5-OPT-OUT) or visit www.optoutprescreen.com. You can choose to be removed from the list for five years or permanently. For the credit cards you already have, you can ask the company to place you on their in-house list that is not sold or traded to any other companies. If any of the junk mail you receive says “return service requested,” “forward service requested,” address service requested” or “change service requested,” you have another option. Get out your marker and write “REFUSED” or “RETURN TO SENDER” on the envelope and put it back in the mailbox. Printing and postage are expensive, so if a business knows you’re not interested, they’ll stop the mailings. In the meantime, you can bring your mail and junk mail (no magazines or catalogs) — plus high-grade office paper —to the Transfer Station Recycling Center. If you are ever concerned about the privacy and security of your personal papers, please know that Rogue Disposal & Recycling offers confidential document destruction through our shred program. Learn more here.